This was originally published on Write Anything, October 23, 2008. Welcome back to Write Anything NaNoWriMo workshop week! *taps monitor* Are you awake? Are you daydreaming? I hope you’re daydreaming about your NaNoWriMo project because guess what? We start in less than 48 hours!!! If you’re just tuning in (welcome! ), we’ve been talking about various aspects of beginning a novel-length story this week. We’ve covered finding ideas, setting, character, point of view, and plot. 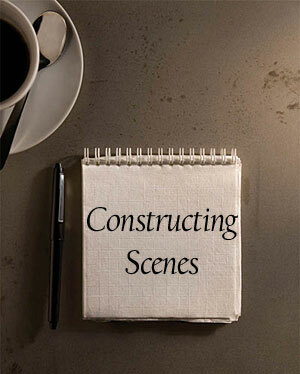 Today, we’ll cover constructing scenes – from start to finish – and tomorrow, I turn the floor over to you and you get to share what sort of progress you’ve made thus far and offer any NaNoWriMo advice. Again, I will be referencing Plot & Structure – Techniques and exercises for crafting a plot that grips readers from start to finish by James Scott Bell because in my opinion, this is one of the best books about plot on the market. If you haven’t checked it out, seriously, dude, look at it. It’s good. Most readers judge whether they will A. continue reading the story, or B. like the story within the first ten pages of reading the story. So tease your readers, make them want to stick around and read the rest of your story with a killer beginning. 1. Get the reader hooked. 2. Establish a bond between the reader and the Lead character. 3. Present the story world – tell us something about the setting, the time, and the immediate context. 4. Establish the general tone of the novel. Is this to be a sweeping epic, or a zany farce? Action packed or dwelling more on character change? Fast moving or leisurely paced? 5. Compel the reader to move on to the middle. Just why should the reader care to continue? 6. Introduce the opposition. Who or what wants to stop the Lead from obtaining his/her goal/objective? First impressions are everything when it comes to tempting people to read your novel. Blow your first impression and you’ll have twice the work to get readers’ attention. Give your readers motion, of something that is about to happen or has happened. If you do this, it’s likely your reader will want to stick around to find out what happens next. We’ve all heard it – in media res – in the middle of things. Start your story in the middle of some sort of conflict. Using dialogue, as in an interrogation, is a good example of this. Suggest there is a not-to-be-missed story about to unfold. A good example of attitude is The Catcher in the Rye. The character’s voice is almost defiant and blase about telling his story. I knew that if I’d never gone to Forks, I wouldn’t be facing death now. But terrified as I was, I couldn’t bring myself to regret the decision. When life offers you a dream so far beyond any of your expectations, it’s not reasonable to grieve when it comes to an end. Brilliant. That definitely makes me want to keep reading. Bell goes on to explain these techniques in detail – it would behoove you to read his suggestions. Again, the beginning? Can gain, or lose, your readers. Hone up on it and be aware that it’s crucial if you want to jerk the reader out of his/her reality and into your story. All of your hard work will (should) compel the reader to move on to THE MIDDLE. Bell offers some suggestions on keeping the middle of your story interesting and moving forward. What is the Lead’s ultimate obstacle? To stay alive. And it’s not all about just physical death, the Lead could have an aspect of themselves die on the inside, too. Or even something die in their professional life, like they are denied a promotion, or they are demoted, or they are involved in a scandal that puts the entire company in jeopardy. The Opposition (which Bell prefers to call the antagonist because not all antagonists are evil), should be stronger than the Lead. Why? Because if they are easily matched, then why should the reader worry? And don’t forget to write your opposition with an empathetic view – it just makes for a better character. An adhesive is any strong relationship or circumstance that holds people together. Life and Death – staying alive is essential to one’s well-being. Professional Duty – a cop can’t just walk away from his assigned case. Moral Duty – a mother will fight to the death in order to get her child back. ARM stands for Action, Reaction, More action. It is the fundamental rhythm of the novel. Think about it. Unless your Lead character is doing something, you have no plot. Plot results from the action of the character to solve the problems in front of him, all with the aim of gaining his desire. Action requires that the character has decided upon an objective and that he has started toward it. This action must be opposed by something or the scene will be dull. So pick an obstacle, an immediate problem to overcome. Bell goes on to explain how to stretch the tension, how to raise the stakes, how to energize a lethargic middle, and how to trim an overweight middle. Again, all GREAT tips to help you get past the middle hump. Why are endings so hard? Because the novelist is like a plate spinner, you know, the guy who spins a dozen plates all at the same time while making sure none of them drop? Maintain the tension in the story until the last possible moment, then give your reader a knockout ending. But in addition to the knockout scene, you need to give your reader a final scene in which something from the hero’s personal life is resolved. 2. We don’t know if the Lead will get his desire – an ambiguous ending. 3. The Lead loses his objective, a negative ending. Don’t forget to tie up any loose information. And only you, the writer, can know if the information is important enough to wrap up. Missing pants are probably not that important. But missing money could be. If the loose information is important enough, you’ll most likely need to write an additional scene. This may entail some extensive rewriting – too bad, do it anyway. The majority of readers do not care for unresolved issues. If it’s minor information that’s flapping in the wind, it’s probably enough to have a character simply explain it away. You want to leave your readers with a last page that makes the ending more than satisfying. You want it to be memorable, to stay with readers after the book is closed. Working to make your last page (memorable) … is worth every ounce of your effort. It’s the last impression, what psychologists call the recency effect. Your audience will judge your book largely by the feeling they have most recently, namely, the end. Leave a lasting impression and you will build a readership. Whew! That’s it! I hope this week proved insightful for you. I also hope it got you excited about writing your novel for NaNoWriMo. Keep all of these things we’ve talked about this past week in your mind, but the bottom line is TO WRITE your story. Try not to think about it too much. Knowing all of this information is great, but the bottom line is, do what feels right for you and your story. Next month is all about quantity, not necessarily quality. Get your words down on paper first, then you can go back and polish later. Thank you for sticking it out with me! If you’re participating in NaNoWriMo this year, look me up! I’ll be giving updates about my writing progress next month, so stick around!